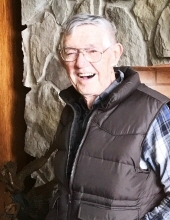 Celebrating the life of Sam A. Jernigan, Jr.
Obituary for Sam A. Jernigan, Jr.
Sam A. Jernigan, Jr., 93, passed away on Wednesday, February 6, 2019 at Wayne UNC Healthcare. Sam was born in Wayne County on December 19, 1925 to the late Sam A. Jernigan, Sr. and Bessie Williams Jernigan. He was co-founder, along with his father and brother, of Sam Jernigan and Sons Furniture Company, now Jernigan Furniture. Sam was married for 69 years to the late Marie Lawson Jernigan. Sam was a firm believer in giving to his country and community. He proudly served his country in the United States Navy during WW II. Sam was a member of Saint Mary Roman Catholic Church where he served as a lectern and usher. He was a 4th degree member of the Knights of Columbus. Sam was a charter member and past President of the Goldsboro Downtown Lions Club where he was a fifty three year lifetime member with perfect attendance. He served as President of the North Carolina Lions Association for the blind. Sam also served as a past District Governor and was awarded the prestigious Melvin Jones Award for his service to Lionism. There will be a service to celebrate Sam’s life on Tuesday, February 12, 2019 at 11:00 a.m. at Saint Mary Roman Catholic Church with Father Pat Keane officiating. Inurnment will be take place Evergreen Memorial Cemetery. Sam is survived by his son, Sam Jernigan III and wife Eleanore of Goldsboro; grandchildren, Conoley Jernigan Coonley and husband Howard of Philadelphia, PA, Sarah Elizabeth Kezirian and husband Stephen of Boston, MA, Sam A. Jernigan IV of New York City, NY, and Andrew Thomas Jernigan of Goldsboro; and seven great-grandchildren. In addition to his wife and parents, he was preceded in death by his sisters, Evelyn J. Pickett, Blanche J. Perkinson and Ruth Jernigan; and brother, Ed Jernigan, Sr. The family will receive friends Monday evening from 5:00 – 7:00 p.m. at the Terrace Room of the Old Goldsboro Hotel in Historic Downtown Goldsboro, 104 S. Center Street, Goldsboro. In lieu of flowers, the family suggests memorial contributions be given to Saint Mary Roman Catholic Church, 1603 Edgerton Street, Goldsboro, NC 27530. To send flowers or a remembrance gift to the family of Sam A. Jernigan, Jr., please visit our Tribute Store. "Email Address" would like to share the life celebration of Sam A. Jernigan, Jr.. Click on the "link" to go to share a favorite memory or leave a condolence message for the family.